This is a very good listening, because it is about the story of Coke invention. Everybody will like because it is curious and interesting. Teacher have to read it out loud while students fill in with the missing words. SOME, ANY, NO, SOMEWHERE, ANYWHERE, NOWHERE ETC. 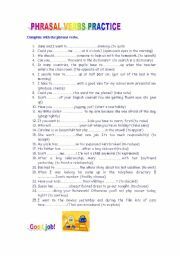 A worksheet to pratice all those indefinite pronouns. STUDENTS LOVE PLAYING THIS GAME. 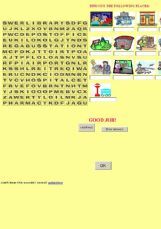 YOU CAN REVIEW MANY TOPICS OF VOCABULARY AND HAVE FUN AT THE SAME TIME. These cards can be use in many fifferent ways. You give a card to student and se/she ask the question to another student using the correct interrogative. The questions should be answer in order to stablish a conversation. A worksheet for advanced groups. 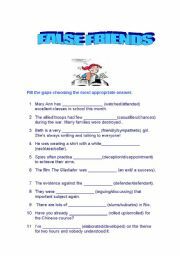 They practice false friends and learn more about vocabulary. You ca use this card in many different ways. Your students just have to put the sentences into passive voice. A GOOD PRACTICE FOR PHRASAL VERBS! ANSWER KEY PROVIDED. First, thanks Edite for the nice template! 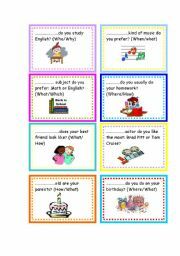 It�s a pwp to practice places and directions! WITH THIS PWP YOU CAN REVIEW VOCABULARY AND PRACTICE PAST AND PRESENT TENSES. 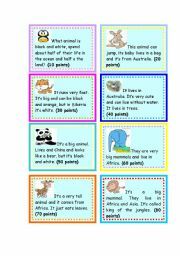 This is an activity which includes all kinds of elementary questions to make students speak and review previous content. Enjoy it! Students will have fun while talking about these movie stars! 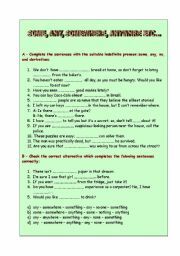 A set of sentences to choose between the simple present or present continuous. 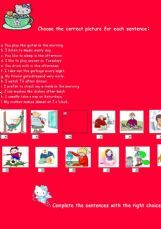 A set of exercises to practice simple past structures orally. 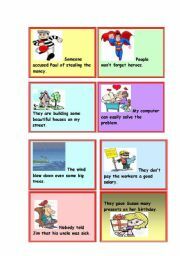 An exercise to practice vocabulary with students. I hope this time this exercise can help you dear teachers! 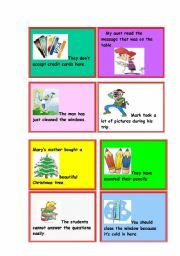 Students talk about the pictures answering questions and they can even make up stories about these nice beautiful pics. Practice past participle of the verbs! 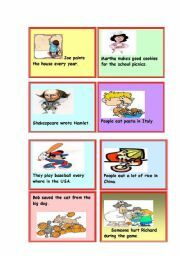 A set of exercises to practice the comparatives and after this a song to enjoy! A practice of simple present and a song to relax! 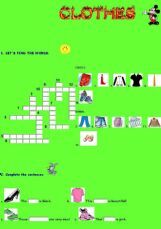 A crossword puzzle to memorize the occupations! Have fun and memorize the places in the city! This is a nice exercise to learn and have fun at the same time. Students can even sing a cute song about colours! I hope they enjoy it! I have removed the video which wasn�t available anymore! A set of exercises to practice the present simple! 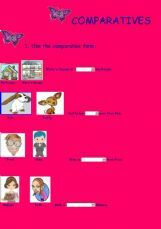 That�s a nice set of exercises to memorize the vocabulary about clothes! PLEASE, DON�T DOWNLOAD THIS OE BECAUSE IT IS EQUAL THE OTHER ONE. I UPLOADED THE SAME EXERCISE BY MISTAKE! THANKS AND SORRY AGAIN!